I have to agree to what you gentlemen already said, for me it is very strange to fit those rims to a car that otherwise would have been an attractive proposition. So these models here are variations on that original theme. We are considering making the necessary mods to make this a stock model. What does everyone think? Stock versions with nice detail and colours would probably sell well to collectors. Stock (especially in blue and white) would be most welcome. Customs only looks good to a few people as everyone has different taste. The style of the trucks now are very unappealing to me. And going by the responses here, I am not alone. Doing a vintage stock truck would be a great direction as for the most part, this has been a area that has been neglected. JSB33 wrote: Stock (especially in blue and white) would be most welcome. If done right (made as models, not toys), I'll buy every version of a stock model released. I think the one in Jeff's picture would be very popular. Its not OEM but It is real. I wish it had different wheels (Cragar SS) or another type wheel that was popular in the 20th century. I just had to get at least one when I saw there was one made in full scale and a limited edition. I wonder how many were made? Last edited by 43rdMuscle on Wed Jan 21, 2015 8:53 am, edited 1 time in total. Frank "OLD CHEVYS NEVER DIE ... THEY JUST GO FASTER"
That's the Mr. Gasket 50th anniversary edition. I was going to buy one for the wheels and boards but at $40 I thought it was overpriced. Rat wrote: That's the Mr. Gasket 50th anniversary edition. I was going to buy one for the wheels and boards but at $40 I thought it was overpriced. That's much better than the eBay sellers. Thanks for the link. That's where I bought mine but IMO shipping was quite high ... so I bought 2 . One for my collection and one for resale later. 43rdMuscle wrote: That's where I bought mine but IMO shipping was quite high ... so I bought 2 . One for my collection and one for resale later. Now with the dimensional weight with UPS and Fedex shipping is not as it used to be. Everytime I ship a package to my customer, they think that they are paying too much for shipping, but I still end up loosing money on shipping. I think the shipping costs have gone up a lot in the last year worldwide. I'm wondering if Greenlight is out of the business of building promotional models for Ford? Seems like a 2015 Mustang should be available by now if it was going to happen. Only a very wild guess but now that Mattel/HW are no longer doing Ferraris could they have pitched for doing Fords? 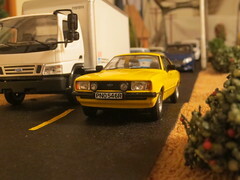 Don't know if Greenlight stopped doing Fords, but in the German Ford-Lifestyle shop (https://ford7.cwshops.com/de/kollektionen/modellautos) there are an 2015 Mustang (20 Feb 2015) and Mondeo (available, US Fusion) announced in 1:43 by Norev. Thanks for the link to the German Ford Lifestyle shop. Glad to see a 2015 Mustang in the works in 1:43. Looks like Norev have some of the gig for 2015 so it's in good hands. The Mustang is available now, I have justed ordered it at the Ford store. Is that an eco-friendly "go-green" Pantera?